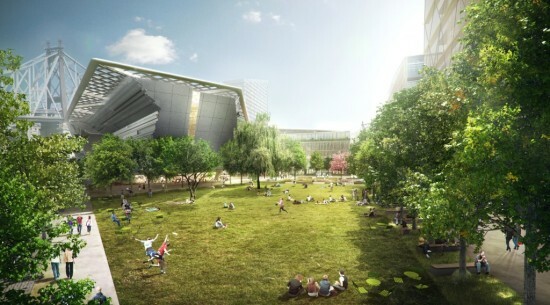 Cornell’s planned campus on NYC’s Roosevelt Island by Morphosis. Anticipation is growing for AN and Enclos’ eagerly awaited Facades + PERFORMANCE conference, touching down in Chicago from October 24th to 25th. Leading innovators from the architecture, engineering, and construction industries will share their insights on the latest in cutting-edge facade technologies that are redefining what performance means for 21st Century architecture. Don’t miss your chance to join Cory Brugger, Director of Technology for Morphosis Architects, as he is joined by a group of industry specialists to lead an in-depth dialog workshop on expanding the idea of performance in the design, engineering, and fabrication of innovative building systems. Set to open its doors in 2017, Morphosis’ winning design for the highly publicized Cornell Tech campus will be breaking ground on Roosevelt Island in the coming year. As part of this ambitious, 2.1 million square foot development, Brugger and his colleagues at Morphosis hope to earn LEED-Platinum certification by with their 150,000 square foot academic building by utilizing cutting-edge modeling techniques and an array of sustainable technologies. “In general, we are designing for extremely high EUI (energy use intensity) goals, which are being accomplished through the use of comprehensive models that integrate mechanical systems, day-lighting analysis, and architectural assemblies,” said Brugger. “This effort is being supported by a 140,000+ square foot PV array that is integral to both the performance and aesthetics of the design. Other technologies include high performance facade systems, smart building technology, and geo-thermal wells.” In conjunction with master-planners SOM and landscape architects James Corner Field Operations, Morphosis are working to create a new model for high-tech education in the information age by extending the definition of performance beyond traditional notions to incorporate far-sighted social and technological considerations. Reserve your space at Facades+ PERFORMANCE now to take part in an intimate discussion. Brugger will be joined my Paul Martin (Zahner), Tyler Goss (CASE), Matt Herman (Burro Happold), and Marty Doscher (Dassault Systèmes ) on Friday, October 25th at the Illinois Institute of Technology Main Campus in Chicago. Don’t forget to check out our other exciting key-notes, symposia, and workshops on the complete Facades+ PERFORMANCE schedule.